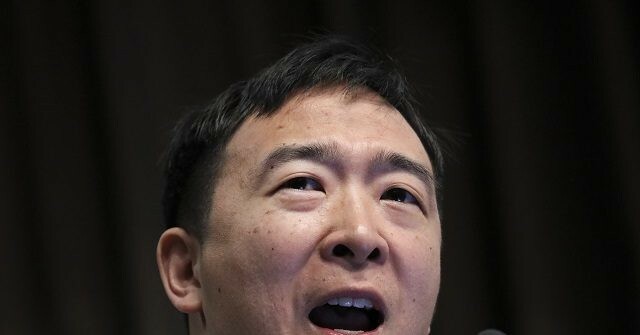 Technology entrepreneur and 2020 Democrat presidential candidate Andrew Yang on Wednesday came out in favor of lowing the federal voting age to 16 years old. Pelosi remarks were part of a full-throated defense of H.R. 1 — the “For the People Act” — which Democrat lawmakers have said will increase voting rights. Republicans have decried the measure a voter fraud enabler which would give Democrats an advantage at the ballot box. The House defeated an amendment to the bill by progressive freshman Rep. Ayanna Pressley (D-MA) which would have lowered the voting age to 16 in federal elections. It was voted down 305-126. Yang is the only Democratic presidential candidate to endorse lowing the voting age. The 44-year-old entrepreneur has never held public office, but his campaign has caught national attention thanks primarily to his proposal of universal basic income (UBI) — distributing $1,000 every month to every adult U.S. citizen. He later announced strong opposition to infant circumcision. Yang’s campaign announced Tuesday that it raised $1.7 million in the past two months from 80,000 donors and has qualified to appear on the debate stage.